James Reed, Chairman of Britain’s biggest and best known recruitment company REED, will head the bill for Watson Martin’s new season of HR Learning Bites, a series of free online information and advice webinars for HR and L&D practitioners. The leading HR training and qualifications specialists announced today three new learning events for the Spring and Summer. 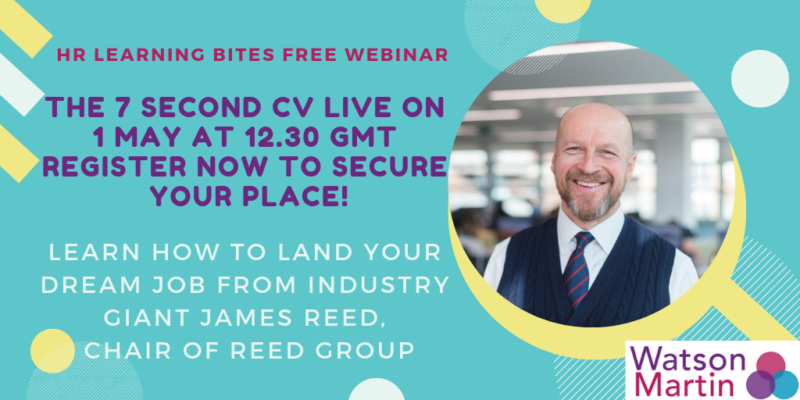 The series will kick off with The 7 Second CV, a 30 minute webinar featuring industry giant, James Reed, who will explain how to ensure a CV makes it to the top of the YES pile along with some nuggets of wisdom for recruiters. The session will go out live on Wednesday 1 May at 12.30 GMT. We are delighted that James Reed will be the expert speaker for our May webinar,” said Watson Martin Director, Melanie Martin. As Chairman of a global recruitment company, a regular commentator on work and labour market issues and a best-selling author, James will provide valuable insight on what employers want to see in the CVs they receive. The key tactic, he tells us, is to ensure your CV grabs a recruiter’s attention within just seven seconds. In our sector, for example, where many HR jobs demand a professional qualification and CIPD membership as a basic requirement for gaining an interview, it is important to put that information right at the top of the CV. Tips like this really do make the difference in a competitive job market and we are really looking forward to hearing more from James in the webinar,” Melanie added. Hurry, click on the button below to register and reserve your place now. Demand is expected to be high, so register now to ensure your place. Do you want to become CIPD qualified but are worried that you won’t have time to study in an already busy life? Never fear, you are not alone! Many of our candidates feel overwhelmed by the thought of juggling work, family and life with the extra pressure of studying for a qualification which is why we have chosen How to Study Around a Busy Life as the theme for our second Learning Bites session in the 2019 series, going out live on Wednesday 12 June at 12.30 GMT. The webinar will provide lots of practical advice and techniques to support your learning journey from managing your time efficiently to devising an achievable study plan. Understand that your life doesn’t need to stop just because you have enrolled on a course! Develop a holistic approach to studying to maintain a good work life balance. Learn how to read for purpose so you can retain the information you need to pass that assessment. Our third Learning Bites webinar will return to the subject of Apprenticeships. We know from previous Apprenticeship learning events that confusion remains around some aspects of the Government’s programme. As a result, the format for this third webinar will be a 30 minute discussion forum where everything to do with Apprenticeships from the thorny issue of the 20 per cent off the job training to the levy itself will be up for debate. In the hot seat answering all your questions will be our expert Sharon White. Apprenticeships – Your Questions Answered going out live in July. Booking for this webinar will be available soon, please check back. Demand for all three webinars is expected to be high so register now to ensure your place. Use the links below to register for the relevant webinars.